In a little over a decade the world could be plunged into a 'mini ice age', scientists have warned.Temperatures will start dropping in 2021, according to a mathematical model of the Sun's magnetic energy.This, they say, will lead to a phenomenon known as the 'Maunder minimum' - which has previously been known as a mini ice age when it hit between 1646 and 1715, even causing London's River Thames to freeze over.The study says that between 2020 and 2030 solar cycles will cancel each other out. The model of the Sun's solar cycle is producing unprecedentedly accurate predictions of irregularities within the Sun's 11-year heartbeat. It draws on dynamo effects in two layers of the Sun, one close to the surface and one deep within its convection zone. Researchers, led by maths professor Valentina Zharkova at Northumbria University, built up on previous research that predicts magnetic waves produced by the sun. However, she has warned her model could not be used as proof of a mini ice age - in part because of global warming. 'I hope global warning will be overridden by this effect, giving humankind and the Earth 30 years to sort out our pollution', she told. The model predicts that the pair of waves become increasingly offset during Cycle 25, which peaks in 2022. 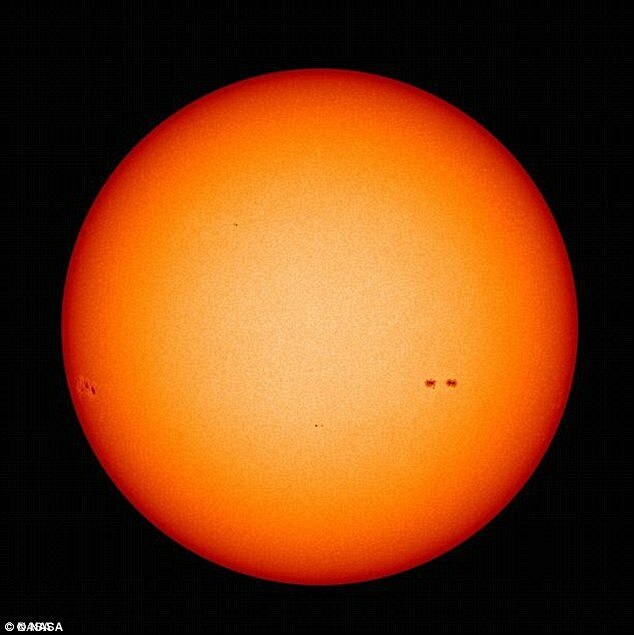 During Cycle 26, which covers the decade from 2030-2040, the two waves will become exactly out of sync and this will cause a significant reduction in solar activity.Predictions from the model suggest that solar activity will fall by 60 per cent during the 2030s to conditions last seen during the 'mini ice age' that began in 1645, according to the results. Dr Zharkova published previous research on this phenomenon in 2015, and the new paper, published this year in Astronomy & Geophysics has reinforced earlier findings. It is 172 years since a scientist first spotted that the Sun's activity varies over a cycle lasting around 10 to 12 years.But every cycle is a little different and none of the models of causes to date have fully explained fluctuations.Many solar physicists have put the cause of the solar cycle down to a dynamo caused by convecting fluid deep within the Sun. 'In cycle 26, the two waves exactly mirror each other – peaking at the same time but in opposite hemispheres of the Sun,' said Dr Zharkova in 2015. 'Their interaction will be disruptive, or they will nearly cancel each other. Dr Zharkova and her colleagues found that adding a second dynamo, close to the surface, completes the picture with surprising accuracy. Dr Zharkova and her colleagues derived their model using a technique called 'principal component analysis' of the magnetic field observations from the Wilcox Solar Observatory in California. They examined three solar cycles-worth of magnetic field activity, covering the period from 1976-2008. In addition, they compared their predictions to average sunspot numbers, another strong marker of solar activity. All the predictions and observations were closely matched.